A great turnout of 293 runners in the senior race, won by Rob Hope with Ian Holmes 2nd, and Ilkley's Sabine Hauswirth first lady followed by Emma Clayton. 160 juniors raced in the Quarry runs. Paul's photos: senior race, U8/10, U8/10 lap 2, U12-U16. Tim's photos of the Quarry Runs here. Dave's photos: Quarry Runs, Senior race. David Spencer's photos: Quarry Runs, Senior race. Someone's revived the FRA Forum thread on the 2007 race for 2008 (watch out, 2008 starts on page 5). Welcome to new Race Sponsor UP & RUNNING who have provided race numbers, something special for every junior's goody bag, and prizes for the senior race. Stoop 2008. Sunday 21st December. BS - 5m/800' from Penistone Hill Country Park, Howarth, W Yorks (GR 025364) Race starts 11.30am, entry �3 on the day only. PM/NS Over 16. Records 28.52 Andi Jones, Salford, 2005, f 35.13 Olivia Walwyn, Altrincham, 2007. Cadbury's Curly Wurly to all finishers. All prizes "Christmas related". Free coffee and biscuits. Google Map of the Senior route here. Someone's revived the FRA Forum thread on the 2007 race for 2008 (2008 starts on page 5). Sunday 21st December. CS. Venue as above, starts from 10.30. �1 entry on the day only. U8 (over 6) 0.5m/100'; U10/12/14 1m/150'; U16 2m/300'. See the Quarry Runs page for records. 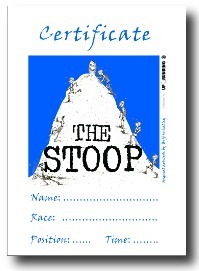 Curly Wurly Mega Goody Bag to all finishers, including a race certificate designed by a rock star (really!) and a Festive reflective Snapwrap from UP & RUNNING. After the success of the Fancy Dress competition at Withins, there will be a "Festive Fancy Dress" competition for juniors, with 6 prizes of Cadbury's Selection Boxes! Curly Wurly race prizes of Dark Knight posters go to the first 3 boys and first 3 girls in U8, U10, U12, U14 & U16 age groups. A bonus for the race winners is Snowballs! There is also a free prize draw to all junior runners who compete with the prizes including a musical ride-along Rudolph, more UP & RUNNING goodies, a Cadbury's Selection Box, and more! Finally don't forget after the prize giving it's the chocolate throw out! This year the Quarry Runs will be videod! More on the Quarry Runs here.